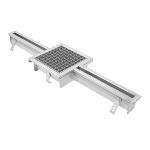 Series BTS AISI Type 304 stainless steel slot channel, 2-3/8in. (60mm) wide x (specify) long, with .5% longitudinal slope and 130 degree cross fall, 13/16in. (20mm) wide drainage slot, and 8in. x 8in. (200mm x 200mm) outlet box with spigot outlet.